Today we're launching support for OAuth Applications. It will allow developers let players log in with their itch.io account inside of a game or program. OAuth provides a flow for your program to securely get an API key that represents another user on itch.io after they approve your application. You can make API calls on behalf of someone using your game or application. You can learn more about the itch.io API here. If you're ready to dive in, read the OAuth documentation, otherwise continue on for a brief summary. To start using OAuth as a developer you'll need to register an application. After filling out a few simple questions about what you're building, your application is approved automatically. Head over to User Settings -> OAuth applications to create your first application. As of today, our OAuth implementation only supports the Implicit Flow, if you need additional support then please reach out to us. 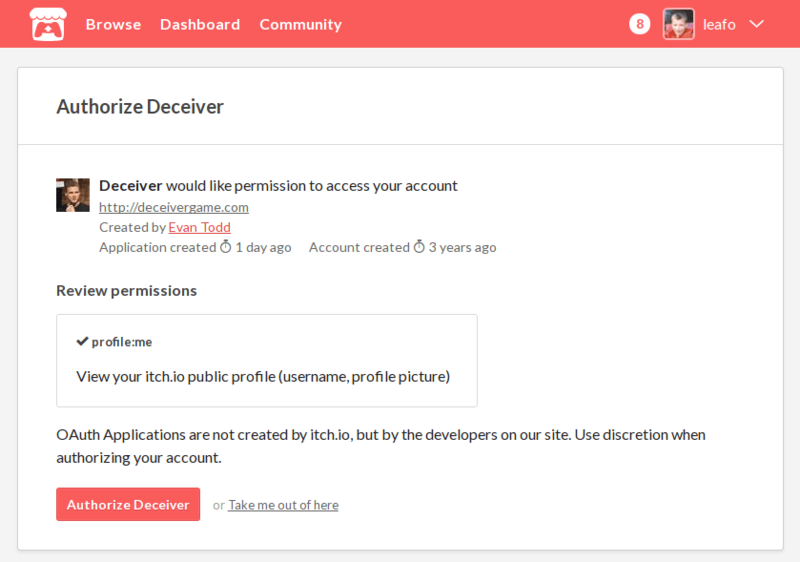 After creating your application, it's as simple as sending any users to your special itch.io login URL. You can view this URL from your application's page in your settings page. Someone logging can review the permissions that are being requests, and approve it to continue. The browser is redirected back to your application where you can access the new API key. After the authorization step is complete you'll have a scoped API key that can be used to communicate with the itch.io server-side API. The most useful API call you can make is to get information about the current user. You can use this to synchronize a user with your own backend. As part of this update we've updated the server-side API documentation with more information about the different API keys, along with a new endpoint. Over the coming months we'll be releasing more API endpoints. If there's something specific you're looking for leave us a comment or send us an email. I hope this is building toward allowing users from an itch.io game to track things like achievements, leaderboards, and other things like that. That is super exciting news!